From traditional Nauvari to Victorian glamour, Rachana picks an eclectic trousseau for her wedding in Pune. Rachana Navale works as the Vice President (Administration) in her Pune-based family business- Sinhgad Institutes, which was founded by her parents M.N. Navale and Sunanda Navale. Her husband Alok Ashtekar is a fourth generation jeweler from the famous Pune-based C.G. Ashtekar Jewelers, and he also manages his own real estate division. High-school sweethearts, Rachana and Alok tied the knot at a mega wedding attended by over 20,000 guests, and held at the Sinhgad Institutes' campus. Here, she tells us about her bridal inspirations and looks for her wedding festivities. As soon as my wedding date was confirmed, WeddingSutra was my starting point in figuring out where to shop, what to expect from specialists and most importantly in putting together my personal to-do list. Apart from WeddingSutra, I also logged onto to other beauty and fashion blogs for tips and advice.,/p. I spent a lot of time researching on Marathi bridal wear- the Nauvari saree, as I was wearing it for the traditional wedding ceremony. For most of my outfits, I shopped at stand-alone designer stores and I was quite clear on what I wanted to wear for every occasion. I customized most of my outfits, and I went with my gut feeling- from choosing the color to the embroideries, silhouette etc. Most of my jewellery was custom-made. I took inspiration from a lot of trends I saw online and discussed my vision with the designers, and they made it all a reality. I took a decision on the outfit for this function really fast! I loved a lehenga as soon as I entered designer Falguni and Shane Peacock's store in Juhu and picked it off the rack! The designers only suggested a few tweaks before it was finally ready. Prior to our festivities, we flew to Paris for our pre wedding shoot, for which my looks were designed by Pune designer- Nivedita Saboo. I wanted an avant garde dress, she designed a red creation with roses, and a white wedding gown with a veil for photos we clicked in front of the Eiffel Tower. The shoot went off really well and it was like a dream come true! We decided to keep our pre-wedding shoot a secret from most of our friends and we showcased the pre-wedding film during our Sangeet as a surprise for them. To keep in line with the surprise, we even chose a Parisian theme for our Sangeet. When our friends saw the film they put all the pieces together and it was a huge hit! For the Sangeet evening, I wore a couture gown by Vikram Phadnis. I didn't want to wear a very bling rich creation, so I chose a very pastel look. My family felt I should choose something brighter, but after I wore it, everyone realized what an amazing creation it is and I think it was one of the most admired ensembles. I knew most of our guests would wear a kaftan in line with the theme, so I wanted to wear something different. I ordered a custom-made sharara by Manish Malhotra, as I felt it would go with the theme, and I thought it would be grand and stunning, and it surely was! Falguni & Shane Peacock designed my outfit for this function too. 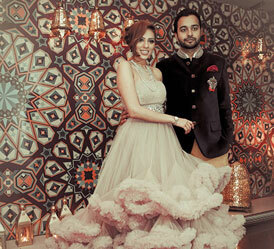 I wanted it to be a simple, fun Mehndi dress so they designed a printed, uber-chic lehenga. I chose a traditional Paithani from a store named Kapse, made from the handlooms of Yeola (a town in Maharashtra). I highly recommend Kapse (Pune) for reasonably priced pure silk sarees especially Paithanis. I wore a traditional yellow saree and completed my look with simple and elegant temple jewellery. Traditional weddings as we all know have their own charm and I love all the elaborate traditions and rituals that are a part of it. Being a staunch Maharashtrian, I've always wanted a traditional wedding and to wear a Nauvari saree as my wedding attire. I scouted the internet, but I was unable to find any styles that matched my taste, so I decided to have it customized! I met several designers and finally I requested the king of fashion (Manish Malhotra) to design it. Yes, he can make any bride's dream come true! We went over a lot of swatches together, and after many meetings and trials, my wedding attire was ready! He even made a matching dupatta to go with it. Also, the 'nath' (nose ring) is the most important jewel one wears with a Nauvari. I wore a traditional nath passed down generations- it was that one piece of jewellery that truly made me feel like a special and lucky bride! For this function, I wanted a Victorian and glamorous look. I'm an avid Vogue reader, and I was totally inspired by a gown worn by actress Hilary Swank. So I shared my ideas with Falguni & Shane Peacock and got a gown custom-designed by them. Falguni and Shane have a feel of what I like, and they understand my style. The result was a peach feathered gown, and it was everything I ever imagined! Bharat and Dorris Bharat and Dorris did all my looks for the wedding. I only showed them my outfits and jewellery and briefed them on the themes, and they were confident of what they wanted to do thereafter. They gave me unique looks for each function, and I was very happy with the results! - Rest well, exercise and eat healthy as you near your big day. I don't believe in too many beauty services, especially if you're trying them for the first time. Sticking to your regular facial and seeing the love of your life at the mandap will give you your special glow! - Delegate, delegate, delegate! Let your family/friends take care of the work that doesn't require your prime attention so you can concentrate on the more important aspects and be stress free. I know it from experience since I tried to do everything on my own, which I now regret as I would have been much more relaxed in the days leading up to the wedding! - I highly recommend my candid wedding photographer Anoop Padalkar for doing such a fabulous job! Before the wedding I had this wrong notion that I am not too photogenic, and I would hate getting clicked, but I was in tears when I saw the photos by Anoop, he captured all the precious moments beautifully! - Vikram Phadnis' store (now Krasaa) is a must-visit store for all brides. They were very professional, delivered my clothes on time and the whole interaction was stress-free. - I recommend Falguni and Shane Peacock to all brides who are looking for designs that are very Western and unique.